Founded on the idea that going clean doesn’t mean turning into a barefoot hippy, but doing what’s ethically right for the safety of ourselves in a luxe way. Next up in our interview series is Leah Thomas of Green Girl Leah, an essential blogger to follow during your shift to green living. 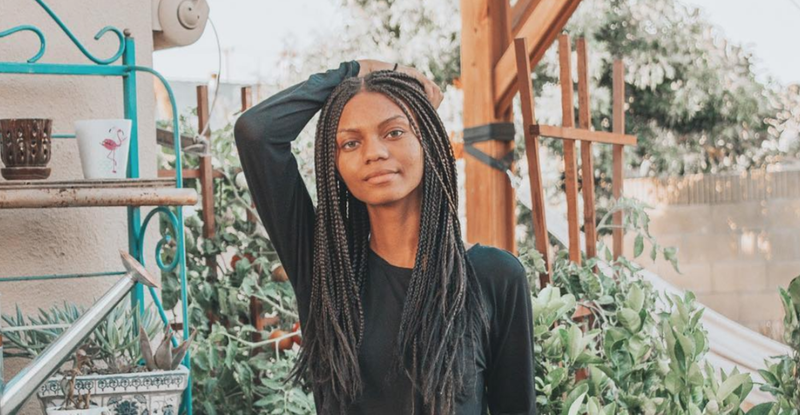 An advocate for everything from clean beauty, clean eating, bettering the environment and bettering yourself, Leah has a great platform with a great message. I have very sensitive organs and I discovered that after I ended up in the hospital with gastritis, an infection, and inflamed organs (which I had no idea was possible). After that, I had to really watch out for flare-ups and alter my lifestyle. I was really defiant for a while, not wanting to accept that I have a sensitive immune system, but when I did I got much better and happier. I studied environmental science and loved companies that were good to the environment and animals, which led me to find a lot of beauty companies. My skin cleared up a lot and I've never looked back! I transitioned to natural hair products when I decided to stop putting so much heat on my hair and let it curl. I've actually only gotten green beauty products online because it's easier and many brands aren't carried in stories. I like companies that are inclusive, so have a large shade range, and are also cruelty-free and non-toxic. I like Au Naturale, Vapour Beauty, River Organics, and Kimberly Elise Haircare. Au Naturale has my favorite mineral foundation of all time and Vapour Beauty has an 'atmospheric' foundation that gives a very Rihanna-like dewy glow. I'll be real, many green-beauty companies have unjustifiably high prices. I don't like that green beauty is so niche and I think healthy products should be accessible to everyone. I find it ethically wrong that people tend to have to pay more or search harder for things that are healthier for them. I wake up and brush my teeth in the shower, I was my face with my Odacite mint face wash or another green-cleaner, I do my makeup with a light green-beauty foundation (Vapour or Aue Natural) then contour with my Fenty beauty stick, followed by river organics highlighter or bronzer, and shaded brows. Throughout the day I refill my reusable coffee containers with water or tea, to avoid plastic waste. I also make sure to turn off my lights and unplug appliances when I can. My mood is more optimistic and steady when I do these things and prioritize self-care! Caring for the environment and world also gives me a purpose and doing things to better the earth helps me fulfill that purpose, which makes me happy. It becomes easier as you go. Once you start making little changes, those changes will become big changes! Start with carrying reusable bags in your car and with you shopping. You can even fold them up in your purse, so they barely take up space. You'll save so much plastic without even thinking about it, just by saying no to plastic bags. Also re-use the plastic bags you have and recycle when you can. If you don't have a recycling bin at home, recycle small plastics, cans, and paper products at your job if they allow you to. Green living overall isn't expensive, it actually helps you reduce money by saving energy and buying less. When you spend more money on ethically and sustainably made products that are made well, you can reuse for much longer and it's worth the investment. Get access to our weekly newsletter, giveaways and exclusive content.